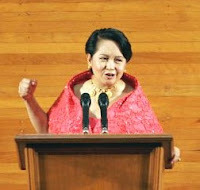 in july 28, the president, in her state of the nation address, reaffirmed her commitment to restore peace in southern philippines. 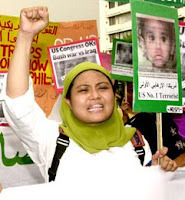 she proved this by secretly forging an agreement with the islamic liberation front to set up bangsamoro judicial entity. contrary to its supposed intention, fighting broke out in mindanao soon after the country’s highest court suspended the draft agreement, finding it unconstitutional. thereafter, the palace uses this situation as a testament that federalism is the only way to peace and consequently, there is a need for charter change. in the meantime, blood was let, lives were lost and homes were burned. is it just me or is it too much to ask: if we are going to be fooled, can it be with a measure of subtlety? but more to the point, how much do the masses of filipinos have to pay in order for the people in power to stay where they are? this has been on my mind recently. not just because coming back to manila tickled my activist bone. not because gloria-bashing is so in vogue its kitsch. but because i am volunteering my time for a research. last week in the course discussing the review of related literature, a member of the research team pointed out that the resulting violence from conflict exploits and oppresses women (more so than in peace time). in a roomful of smart people steeped in studies on peace, nobody had an answer. i have spent the last seven years of my life in a country which is hailed as the shining example of peaceful transformation to democracy. but i was there long enough to know that while racism may be made illegal, the violence continues. and you know what? it’s the women who suffers most. countless men who don’t have anymore big battles to fight remain disenfranchised. so they turn their anger towards their own homes, to those who are close to them, to those who cannot defend themselves. in the not-so-distant past our country also gained worldwide recognition because of a so-called peaceful democratic revolution. but after we have given our flowers to soldiers standing on tanks, after we have tired of the yellow ribbons, after we have stopped seeing apparitions of the holy mother atop mass mobilisations, who even remembers what went down there? come to think of it, wasn’t it another ‘revolution’ on the same fateful street that put this president into power? those revolutions were all so wonderfully peaceful. hey, look where it got us. which gets me to the question, when is violence justifiable? when is it necessary? but then again, is war the answer? if we know that those who are going to be killed aren’t those who decide in the seats of power, will it ultimately be just? why should the dispossessed fill the front-lines of a war caused by the rich? i’m so full of questions recently that i am my own demented quiz show. for that, i'll give you the Miss Photogenic title. (though Ms. A on the other pic is prettier than you. charot!). there's a just war and there's an unjust peace. time comes when the poor won't be the cannon fodders in the war for power of the rich. maybe then there'll be world peace. there's no such thing as peace, there's only negotiation. of course the poor will have to suffer, kaya nga sila "poor" di ba kasi kawawa? and the women should suffer as well, because they'r weak. mas maganda ka kesa sa photong napili mo hehehe. world peace para sa lahat ng laseng! if the people in power who were put in power by the people, will use the people to extend their stay in power by launching a war against the people, then we should really get rid of these people in power once and for all....and it is a bloody process. literally. a revolution is not a bed of roses, as pareng fidel castro said. a revolution is a struggle to death between the future and the past. @ jericho - manipis talaga ang make-up ko sa pic - so... tse! from a cultural politics frame just war and unjust peace is the same thing. basta! yung last 3 sentences ng comment mo pang Q&A portion - type mo ring mag beaucon anoh?! @id - ang evil mo talaga. 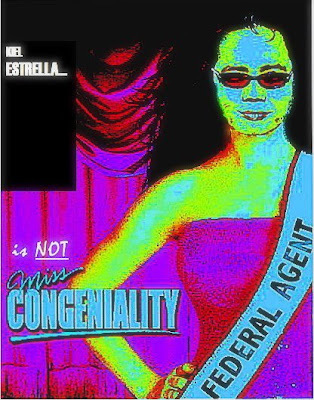 pero dahil sabi mo maganda ako kesa sa pic, kunin kitang judge sa aking fantasy beaucon. @gibo (d emcee of the beaucon to end all beaucons) - as a environmentalist you should understand why i am growing a national forest between my legs! hahahaha!!! i really like this. it just made my day. @ cherry - glad my irreverent humour can still make you laugh. sickle dapat ang ginagamit sa thank you girl na yan. well said, contestant number 69. @ yffar - baka naman kung ano- ano ang isinusuot mo dyan sa ilong mo - sisihin mo pa ang blog ko. bigyan kita ng tissue. pamunas ng anetch. tse! @ kiks - abah, at may balak pang kumpetensyahin si gibo sa emcee of my fantasy beaucon. cge pompyang kayo, matalo... magiging contestant na lang! @ mr. scheez - thanks! glad you like it.